B.F. Graham introduced Cynthia Groya; Russell Marks, George Webb; Julia Denny Clark, Patti Daley; David Wetherill, Pam Wetherill, and Juliana McIntyre introduced Constance Escher. 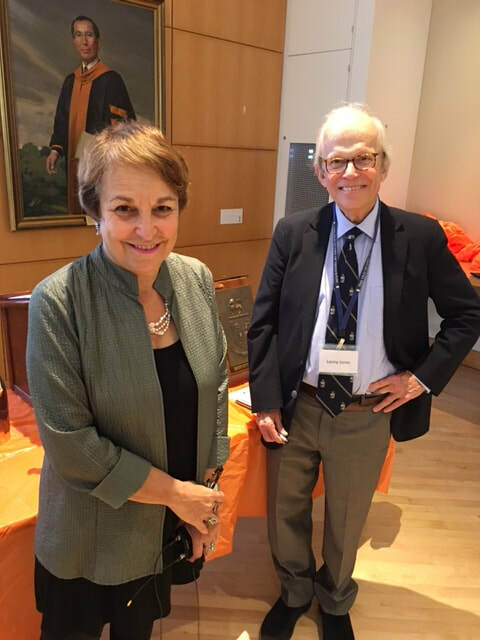 The minutes of the previous meeting having been read by David Tierno, Landon Jones introduced the speaker, Martha A. Sandweiss, professor of history at Princeton University. The Princeton Slavery Project had a modest start, beginning in 2013 as a small class at the university. Professor Sandweiss pointed out that no one was doing anything, and her idea was to start with five students in a one-off class. No one, she said, asked for it. Now over 30 contributors have generated vast archives of research papers, 80 to 90 stories and a number of videos and graphs -- all of which are being shared with local institutions like the university art museum and McCarter Theater, the Historical Society of Princeton, the public library and schools. Musical compositions and plays also are being commissioned, and similar inquiries are being conducted by Harvard, Columbia, and the University of Virginia. Professor Sandweiss predicts that what started on such a small scale will soon become a complicated and difficult but informed public conversation. This is, she said, what Princeton University does best. Professor Sandweiss described the university as long having been in the grip of an ideology. It was not merely a racial ideology, as she later explained during the discussion, but one much more encompassing. It embraced the South and Southern culture. Furthermore, aided and abetted by the beliefs and values of the Southern Presbyterian church, this ideology had wings, legitimacy and authority. The power of this ideology was present from the beginning of the university. By accepting their capital, the university had also entered into their worldview. Professor Sandweiss noted that all seven of the founding trustees, and 18 of the first 20 trustees, were slaveholders. Similarly, the university’s fifth president kept women and children in slavery and sold them on campus. In fact, slaves were visible everywhere one looked -- working, farming, delivering firewood and ushering students into the president’s house for their admissions examinations in Latin and Greek. Thus Professor Sandweiss described the campus as the landscape of slavery. It was how the world looked to them and how they saw the world. Under the influence of this ideology, the university actively sought Southern students and Southern donors. For instance, Princeton fundraisers pursued those donors from plantation to plantation, tavern to tavern, all across Virginia. Southern families were encouraged to send their sons to Princeton, and in the process, the university increased the number of students from the South, uniquely so from Mississippi, until they at times amounted to more than 60 percent of the student body. No wonder many of its students were shocked by the presence of free people of color in Princeton itself, as indeed was the arrival of the occasional abolitionist, one of whom the Princeton students tarred, feathered and drove out of town. As Professor Sandweiss observed, students at the university were unable to see beyond the landscape of slavery; what they thought they were seeing in Princeton were not free men and women of color but the lazy and unreliable slave folk of Southern ideology, and they remained undissuaded when confronted with the observations of others that did not fit their facts. As a member of the Old Guard pointed out in the subsequent discussion, the Witherspoon community, as early as 1855, was well educated, with many families possessing farms and small businesses. But Southern ideology had staying power. For instance, even after New Jersey had passed the Emancipation Act, the university’s senior vice president, John McClean, advertised his slave girl for sale. Even long after the 13th Amendment became the law of the State of New Jersey, the university continued to profit from capital raised by slave labor. Well into the 20th century, the university continued to accept capital raised from slave labor. Some of that capital had passed to the university through major corporations in the North but much of it came directly from the antebellum plantation. In fact, Professor Sandweiss made a point of showing how Moses Taylor Pine donated capital generated by the slaves of his grandfather, Moses Taylor. A Princeton monument testifies to the persistence of this ideology: a monument honoring Princeton graduates slain in the War Between the States. That monument fails to take sides or even to distinguish between those who died either for the North or the South. As Professor Sandweiss pointed out, the monument reflects the university’s unwillingness at the time to challenge slavery at a time when the university had also contributed to the Stone Mountain monument to Jefferson Davis, Stonewall Jackson and Robert E. Lee. When a member of the Old Guard asked whether the monument could signify the possibility of a wider, more national reconciliation, the professor noted that the monument simply suggests that every boy did what he at the time had thought best. There was goodness on both sides. This will be, as Professor Sandweiss noted, a complicated and difficult discussion, but it is what Princeton University does best.